The colours of Bevagna among workshops and age-old trades. 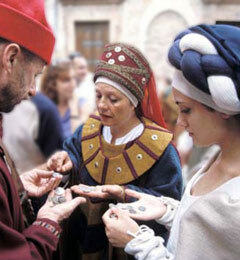 The daily life of the Middle Ages is the theme of the Market of the Gaite (Mercato delle Gaite),which takes place in Bevagna from 16 to 25 June. For the event the town is divided into four districts : San Giorgio, San Giovanni, San Pietro and Santa Maria which compete against each other in the recreation of craftsmen''s workshops and trades of the period. The taverns, open during the festivities, give the visitors the opportunities of tasting Umbria''s delicious cuisine in an informal but characteristic setting. The painstaking historical research and the enthusiasm of the Bevagnese have enabled the market to recreate the intense atmosphere of the world of the cratsman with its sounds and images recalling the bygone era. In the small workshops of the hemp worker, the potter, the dyer and the smith skilled craftsmen create products employing exclusively the art and techniques of the Middle Ages. Walking along the streets of the centre you easily reach the main square of Bevagna which with its medieval character provides the scenario most appropriate for the Market of the Gaite as well as the setting for the most representative moments, such as the opening and closing ceremonies and the contest between the districts.